A Meeting House for the Saints. —. Forced to leave their homes along the Mississippi, the Mormons began arriving in the Missouri River Valley in June of 1846. By September, nearly 4,000 refugees had begun to settle in for the winter - laying out blocks and streets, building cabins for shelter, a grist mill (see across the intersection to your right) and a town hall. "Winter Quarters", as it was called, had two main streets with 38 blocks, each containing 20 lots covered with crude shelters, tents, dugouts and log cabins. The 22 by 32 foot town hall, or "Council House", was the social center of the refugee camp. Here, social gatherings, religious meetings and dances helped lighten the hearts of the Saints allowing them to temporarily forget the cold and misery of winter. The log structure was one-and-a-half stories high, with wooden floors, fireplaces, and windows. 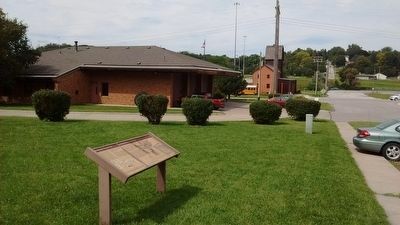 It was located in the area where the firehouse now stands. A nearby cemetery, containing the graves of several hundred emigrants, attest to the harshness of the winter and the crude living conditions they experienced while waiting for spring and the opportunity to continue the journey west. Thomas Bullock, November 28, 1846 . "Went thro' the City, nine weeks ago there was not a foot path or a Cow track, [but] now may be seen hundreds of houses, and hundreds in different stages of completion. [It is] impossible to distinguish the rich from the poor; the Streets are wide and regular and [there is] every prospect of a large City Being raised up here." Wilford Woodruff's Journal, January 28, 1847 . "In company with Mrs. Woodruff & Sisters Taylor & Smoot. I went to the Council House in company with the quorum of the the Twelve & Seventies. We spent the day in the worship of God by prayer, singing Music & going forth in the dance together before the Lord. We were merry and rejoiced before the Lord." Forced to leave their homes along the Mississippi, the Mormons began arriving in the Missouri River Valley in June of 1846. By September, nearly 4,000 refugees had begun to settle in for the winter - laying out blocks and streets, building cabins for shelter, a grist mill (see across the intersection to your right) and a town hall. "Winter Quarters", as it was called, had two main streets with 38 blocks, each containing 20 lots covered with crude shelters, tents, dugouts and log cabins. "Went thro' the City, nine weeks ago there was not a foot path or a Cow track, [but] now may be seen hundreds of houses, and hundreds in different stages of completion. [It is] impossible to distinguish the rich from the poor; the Streets are wide and regular and [there is] every prospect of a large City Being raised up here." "In company with Mrs. Woodruff & Sisters Taylor & Smoot. I went to the Council House in company with the quorum of the the Twelve & Seventies. We spent the day in the worship of God by prayer, singing Music & going forth in the dance together before the Lord. We were merry and rejoiced before the Lord." "Passed the old Mormon burying ground, and town...there [their] burying ground covers an acre and were just as thick as they could dig the graves. It beat anything I ever saw." Other nearby markers. At least 8 other markers are within walking distance of this marker. 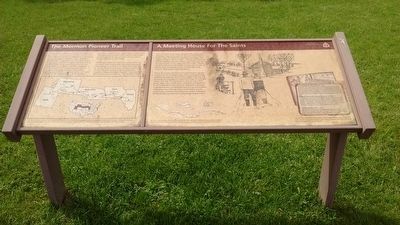 The Mormon Pioneer Trail (here, next to this marker); The Florence Mill (about 400 feet away, measured in a direct line); a different marker also named The Florence Mill (about 400 feet away); The Road to Zion (about 400 feet away); From Indian Lands to the Golden Gate (approx. 0.3 miles away); A Little Town That Dreamed of Greatness (approx. 0.3 miles away); The Bank of Florence (approx. 0.4 miles away); Mormon Pioneer Memorial Bridge (approx. 0.4 miles away). Touch for a list and map of all markers in Florence. More. Search the internet for A Meeting House for the Saints. Credits. This page was last revised on June 16, 2016. This page originally submitted on November 12, 2015, by Tom Bosse of Jefferson City, Tennessee. This page has been viewed 322 times since then and 16 times this year. Last updated on November 14, 2015, by Keith S Smith of West Chester, Pennsylvania. Photos: 1, 2. submitted on November 12, 2015, by Tom Bosse of Jefferson City, Tennessee. • Andrew Ruppenstein was the editor who published this page.